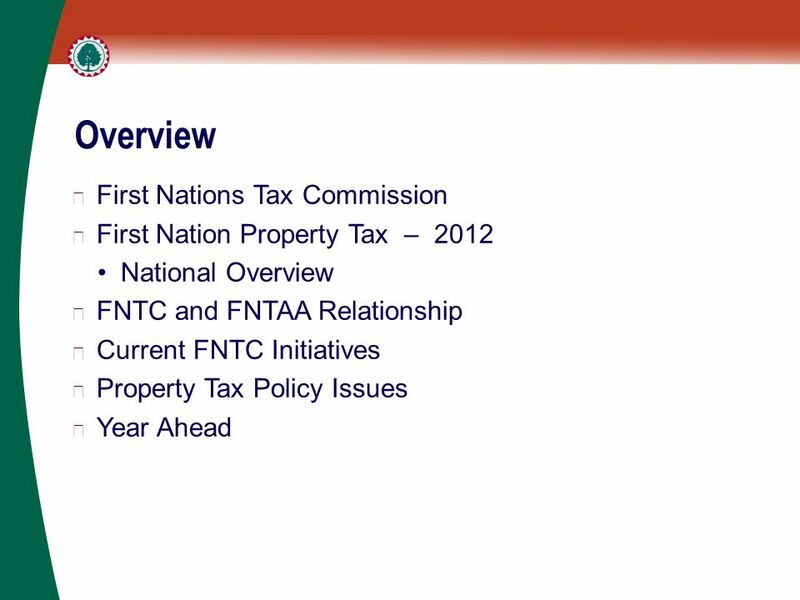 3 Introduction ▶ First Nations Tax Commission created in 2005 by the First Nations Fiscal and Statistical Management Act. ▶ Builds on the work of the Indian Taxation Advisory Board. 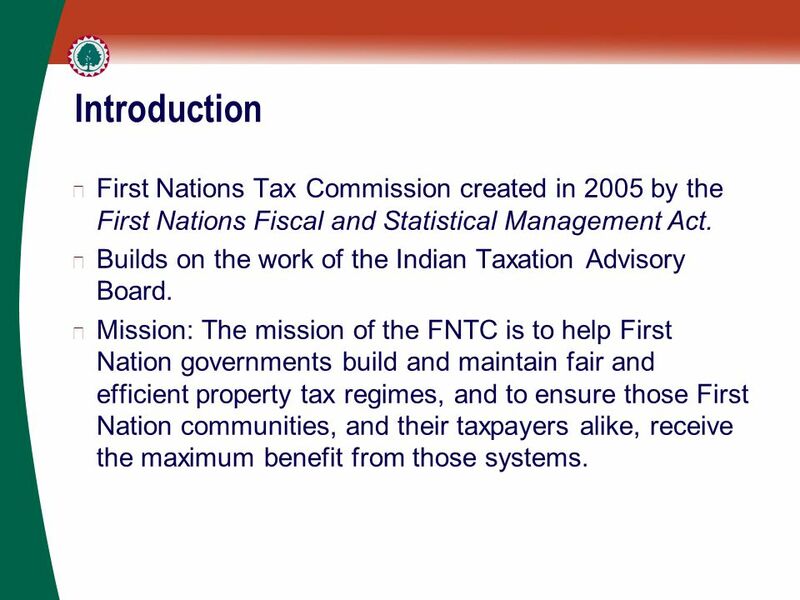 ▶ Mission: The mission of the FNTC is to help First Nation governments build and maintain fair and efficient property tax regimes, and to ensure those First Nation communities, and their taxpayers alike, receive the maximum benefit from those systems. 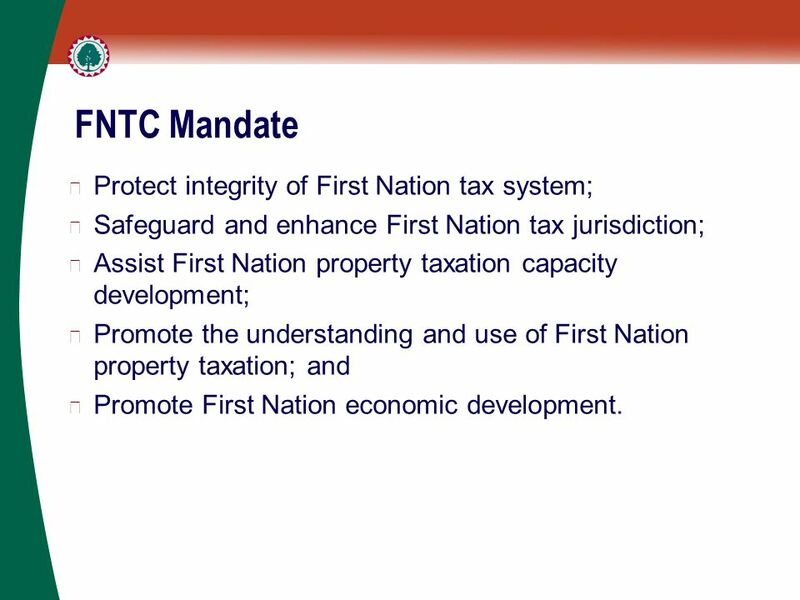 5 FNTC Mandate ▶ Protect integrity of First Nation tax system; ▶ Safeguard and enhance First Nation tax jurisdiction; ▶ Assist First Nation property taxation capacity development; ▶ Promote the understanding and use of First Nation property taxation; and ▶ Promote First Nation economic development. 6 FNTC Functions and Services ▶ Law Review and Approval - Review and approval of FSMA laws. 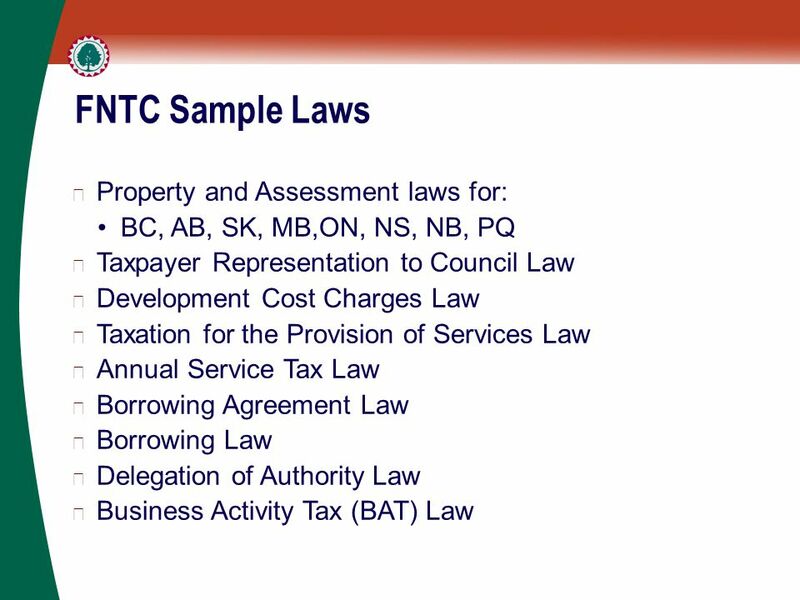 ▶ By-law Review – MOU with AANDC ▶ Policy – Development of policy supporting the First Nation property tax framework: legislation, regulations, Commission Standards, policies, and sample laws/by-laws. ▶ Education - Accredited training at the Tulo Centre. 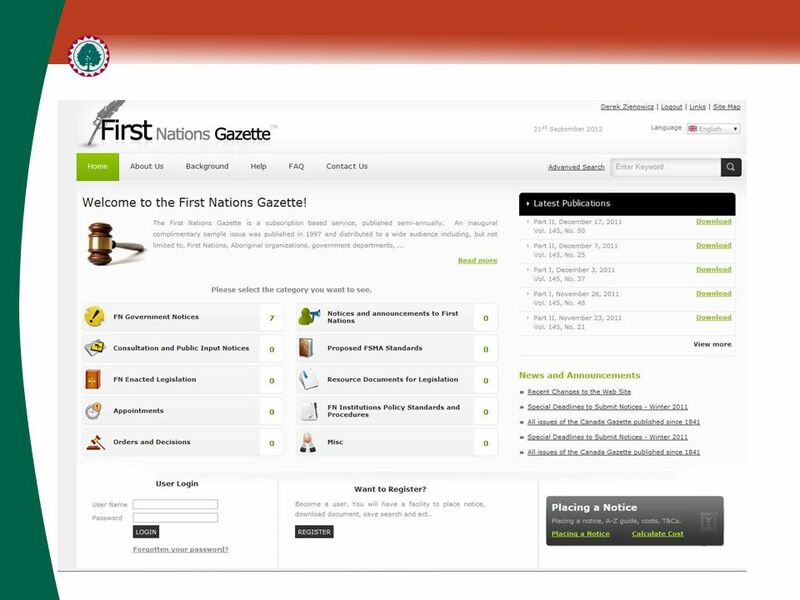 ▶ Registry and Publication of Laws – First Nations Gazette. ▶ Dispute Resolution – Informal and formal mechanisms. 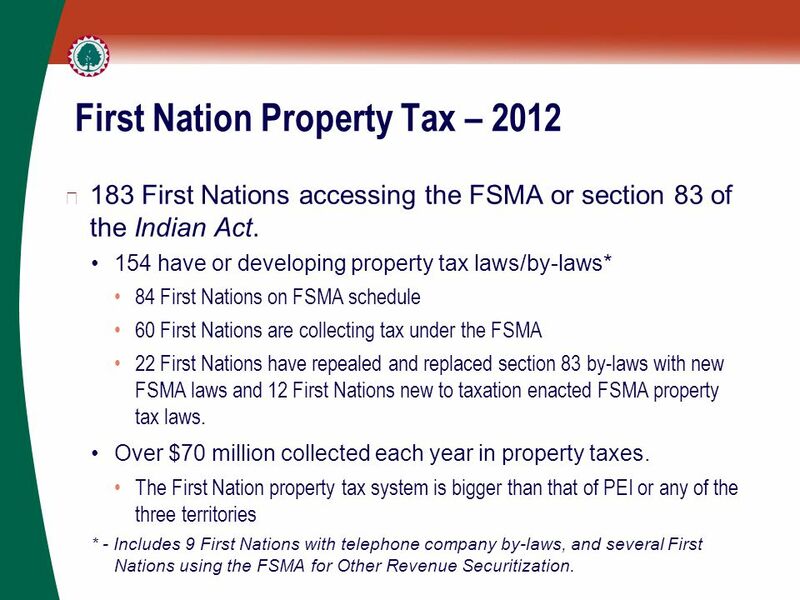 8 First Nation Property Tax – 2012 ▶ 183 First Nations accessing the FSMA or section 83 of the Indian Act. 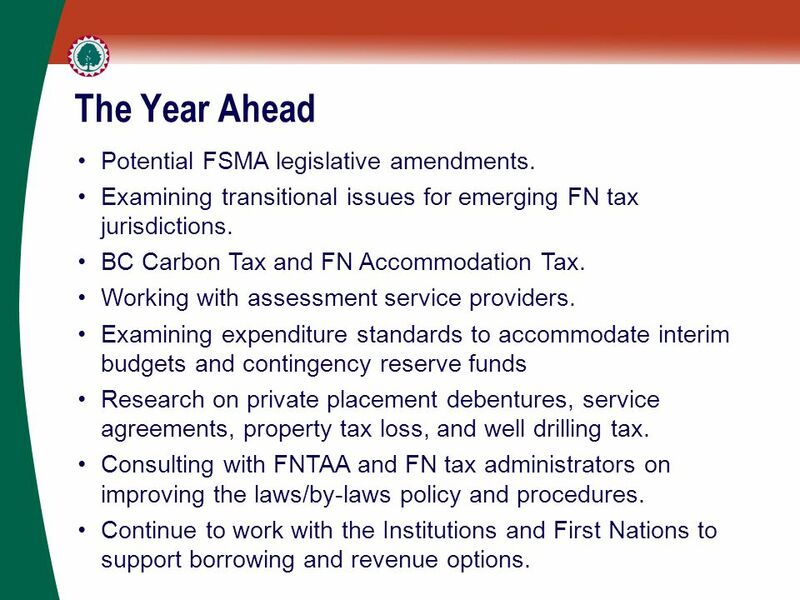 154 have or developing property tax laws/by-laws* 84 First Nations on FSMA schedule 60 First Nations are collecting tax under the FSMA 22 First Nations have repealed and replaced section 83 by-laws with new FSMA laws and 12 First Nations new to taxation enacted FSMA property tax laws. Over $70 million collected each year in property taxes. 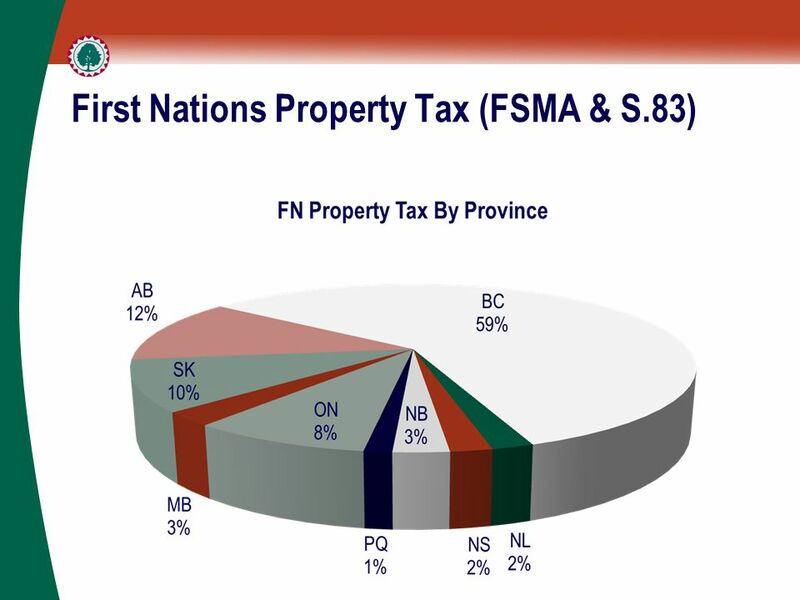 The First Nation property tax system is bigger than that of PEI or any of the three territories * - Includes 9 First Nations with telephone company by-laws, and several First Nations using the FSMA for Other Revenue Securitization. 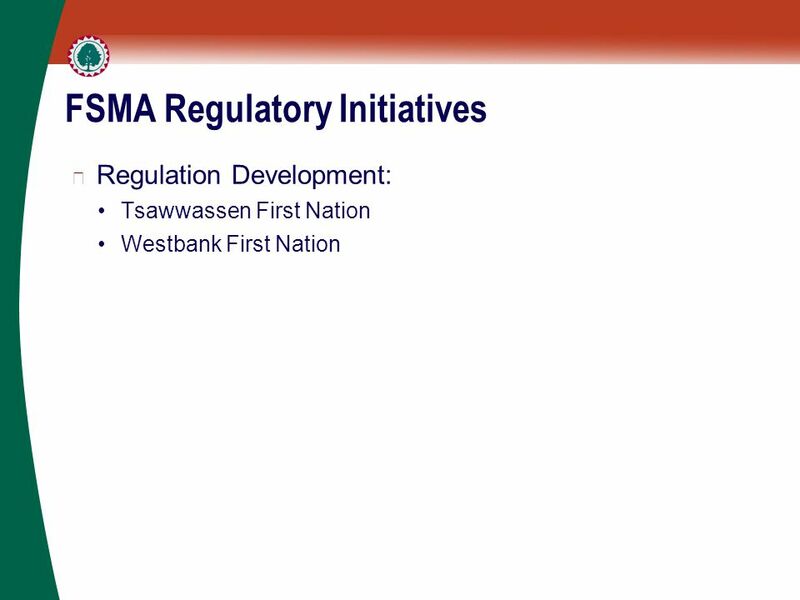 10 FSMA Participation is Increasing ▶ 25 First Nations added to the Schedule of the FSMA since September 2011. 5 Order Amending Schedule (September 30, 2011) 10 Order Amending Schedule (March 2, 2012) 10 Order Amending Schedule (June 8, 2012) ▶ Represents a 40% increase in FSMA participation. ▶ Over 50% from regions outside of BC. 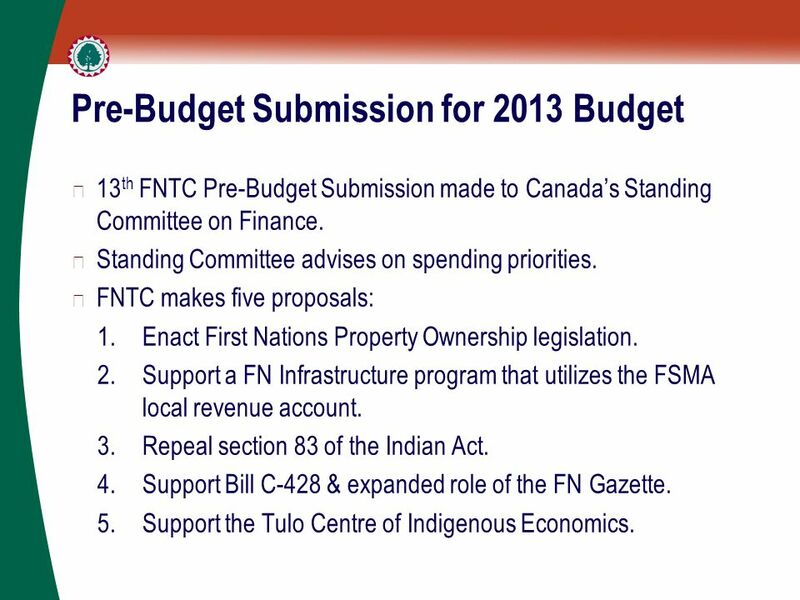 15 Pre-Budget Submission for 2013 Budget ▶ 13 th FNTC Pre-Budget Submission made to Canada’s Standing Committee on Finance. ▶ Standing Committee advises on spending priorities. 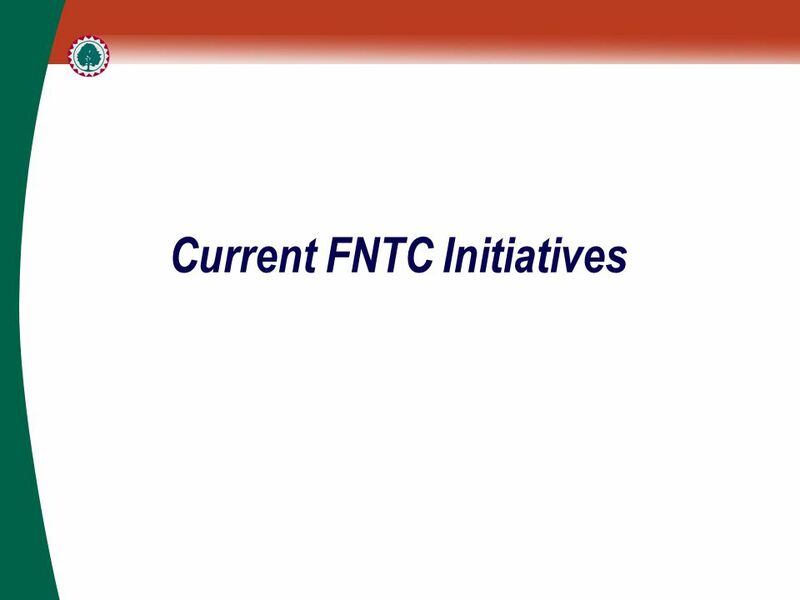 ▶ FNTC makes five proposals: 1.Enact First Nations Property Ownership legislation. 2.Support a FN Infrastructure program that utilizes the FSMA local revenue account. 3.Repeal section 83 of the Indian Act. 4.Support Bill C-428 & expanded role of the FN Gazette. 5.Support the Tulo Centre of Indigenous Economics. 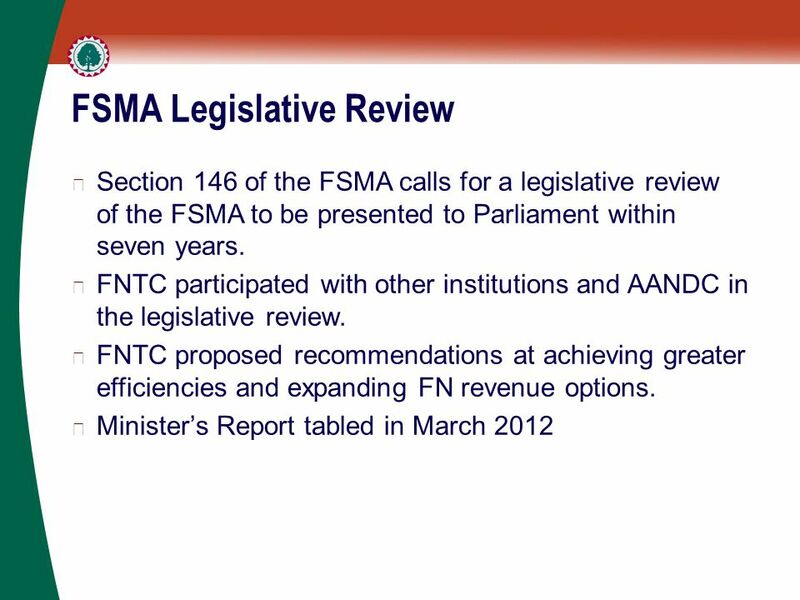 17 FSMA Legislative Review ▶ Long standing issue for First Nations tax system ▶ Proposed amendments include: Expanding local revenue definition, section 2(1) Providing for the power to collect costs of enforcement, section 5(1)(a) Reducing notification requirements, section 6 Reducing documentation requirements, section 8 Clarifying annual law timing requirements, section 10 Clarifying expenditure law authority, section 13 Delegation to panels, section 36 ▶ Other FN Fiscal institutions proposed additional amendments. ▶ Government considering legislative options. 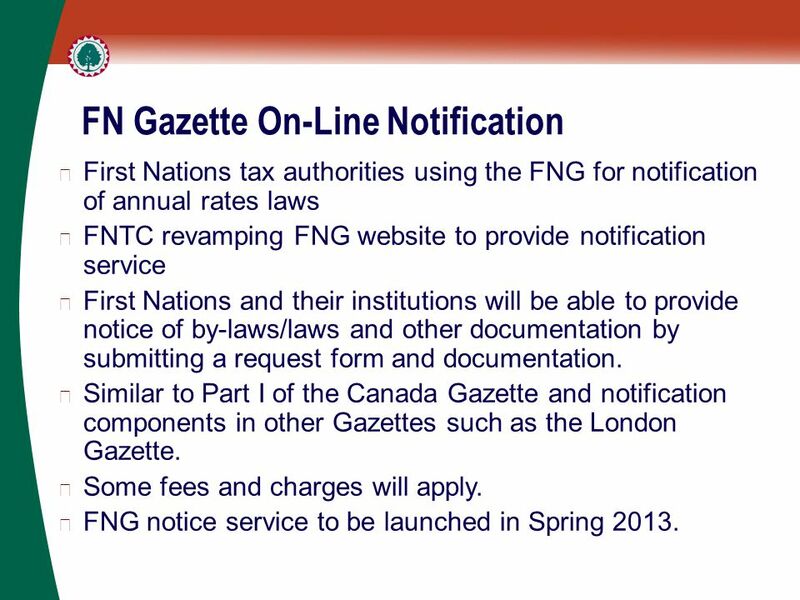 19 FN Gazette On-Line Notification ▶ First Nations tax authorities using the FNG for notification of annual rates laws ▶ FNTC revamping FNG website to provide notification service ▶ First Nations and their institutions will be able to provide notice of by-laws/laws and other documentation by submitting a request form and documentation. ▶ Similar to Part I of the Canada Gazette and notification components in other Gazettes such as the London Gazette. ▶ Some fees and charges will apply. ▶ FNG notice service to be launched in Spring 2013. 21 Support to Borrowing First Nations ▶ Approved three First Nations borrowing agreement laws. 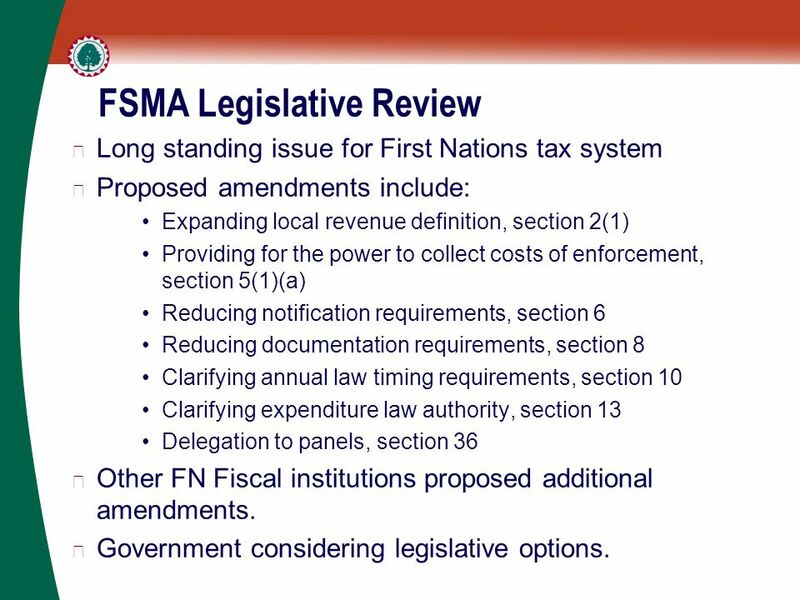 ▶ Clarified the ability of First Nation to use local revenue to refinance existing capital projects. ▶ Borrowing member workshop planned for the fall 2012. 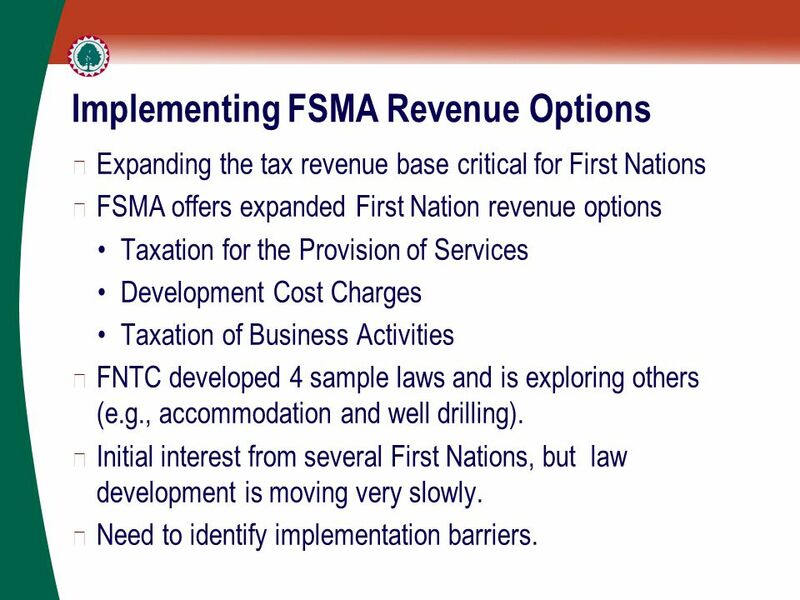 25 Implementing FSMA Revenue Options ▶ Expanding the tax revenue base critical for First Nations ▶ FSMA offers expanded First Nation revenue options Taxation for the Provision of Services Development Cost Charges Taxation of Business Activities ▶ FNTC developed 4 sample laws and is exploring others (e.g., accommodation and well drilling). 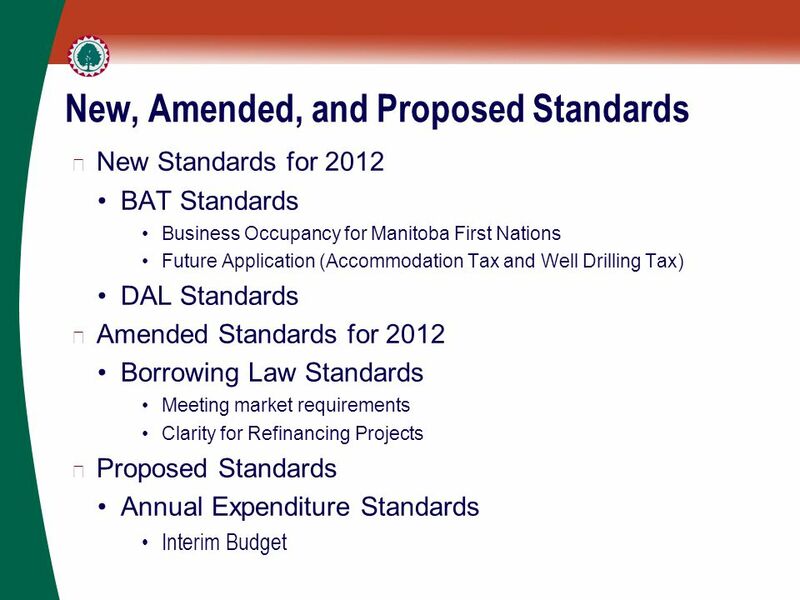 ▶ Initial interest from several First Nations, but law development is moving very slowly. 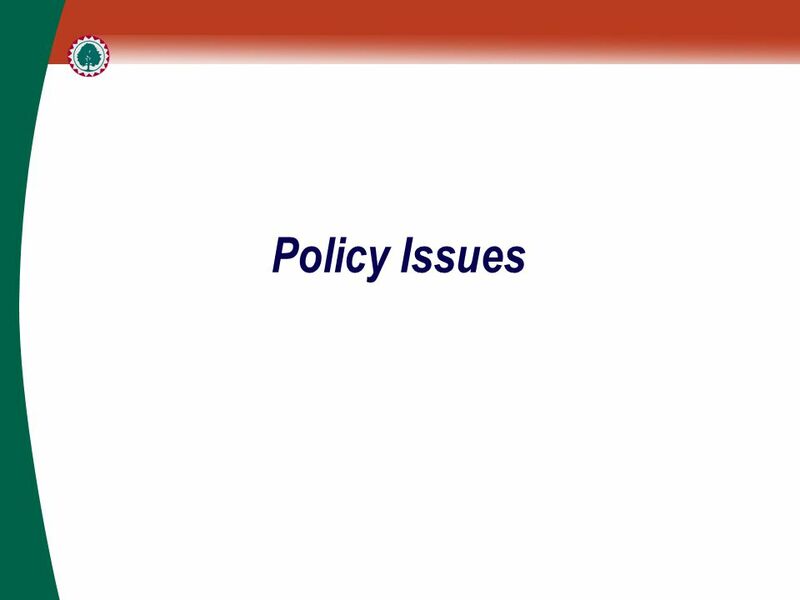 ▶ Need to identify implementation barriers. 26 Contingency Reserve Funds ▶ Contingency reserves are used by local governments for emergency purposes and cyclical downturns in revenue. 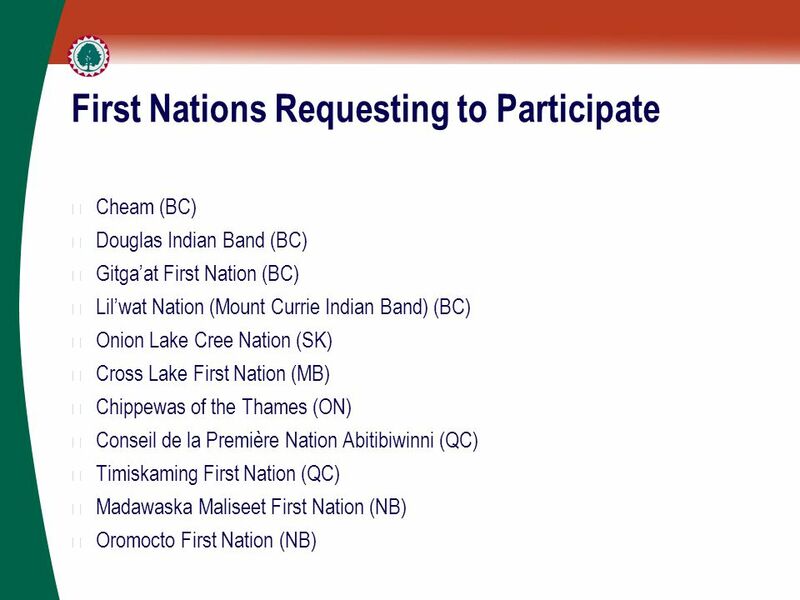 ▶ Several First Nations have established these reserve funds under section 83 of the Indian Act. 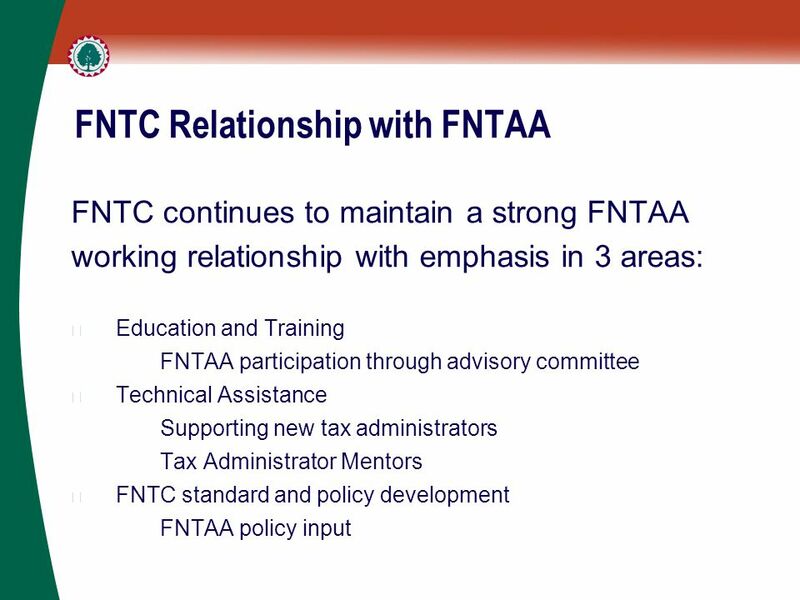 ▶ Current FNTC Standards do not adequately accommodate the use of these types of reserves. 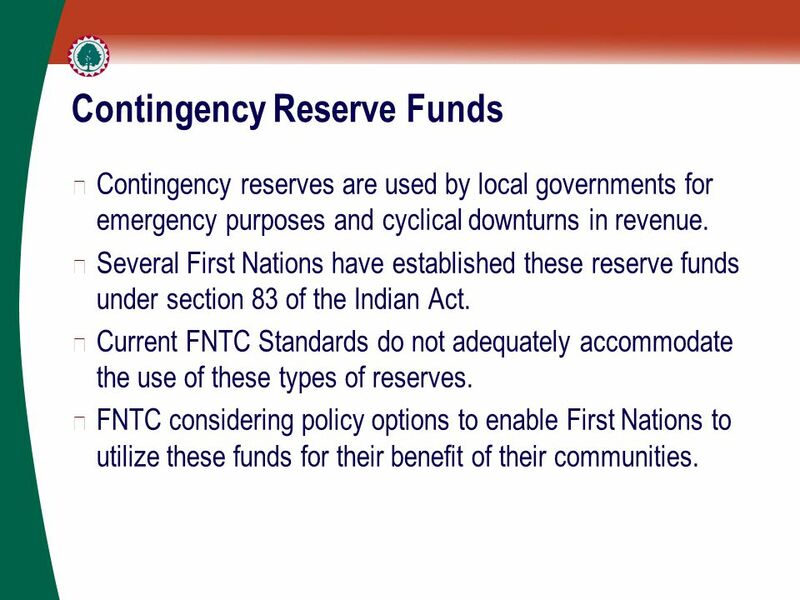 ▶ FNTC considering policy options to enable First Nations to utilize these funds for their benefit of their communities. 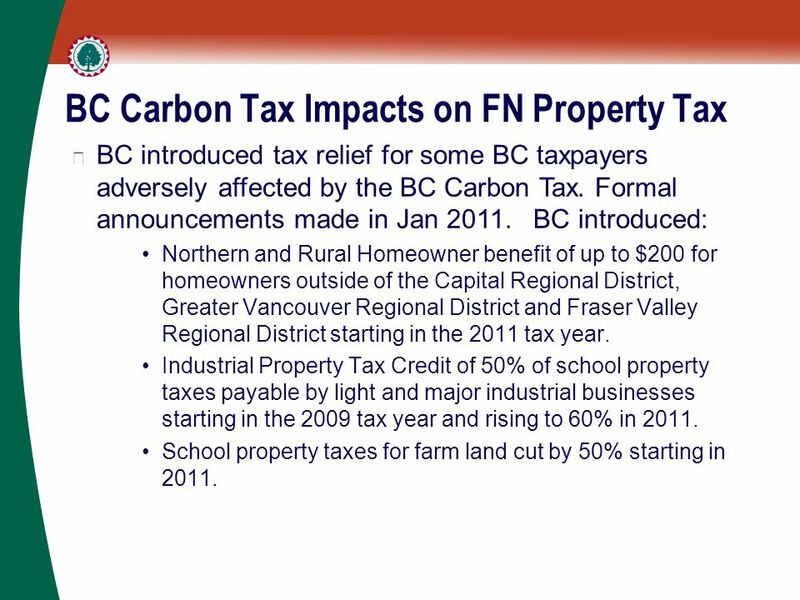 27 BC Carbon Tax Impacts on FN Property Tax ▶ BC introduced tax relief for some BC taxpayers adversely affected by the BC Carbon Tax. Formal announcements made in Jan 2011. BC introduced: Northern and Rural Homeowner benefit of up to $200 for homeowners outside of the Capital Regional District, Greater Vancouver Regional District and Fraser Valley Regional District starting in the 2011 tax year. Industrial Property Tax Credit of 50% of school property taxes payable by light and major industrial businesses starting in the 2009 tax year and rising to 60% in 2011. School property taxes for farm land cut by 50% starting in 2011. 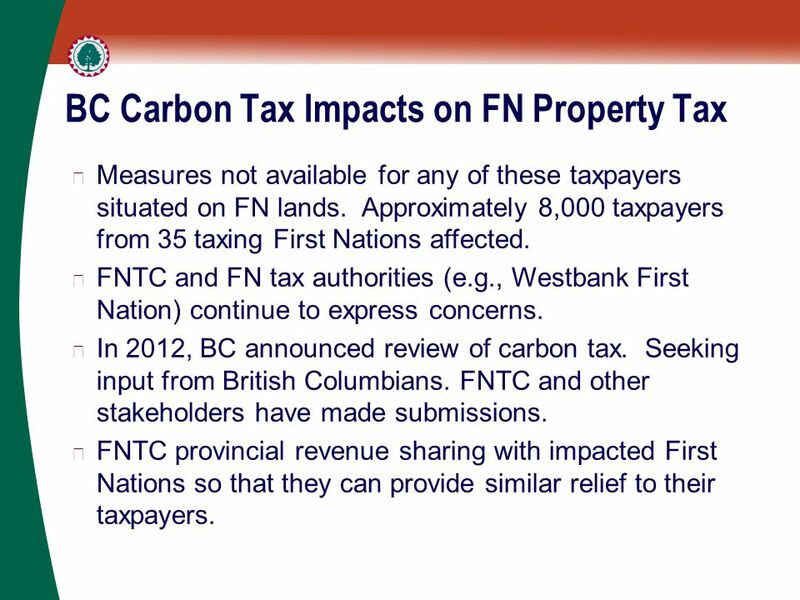 28 BC Carbon Tax Impacts on FN Property Tax ▶ Measures not available for any of these taxpayers situated on FN lands. 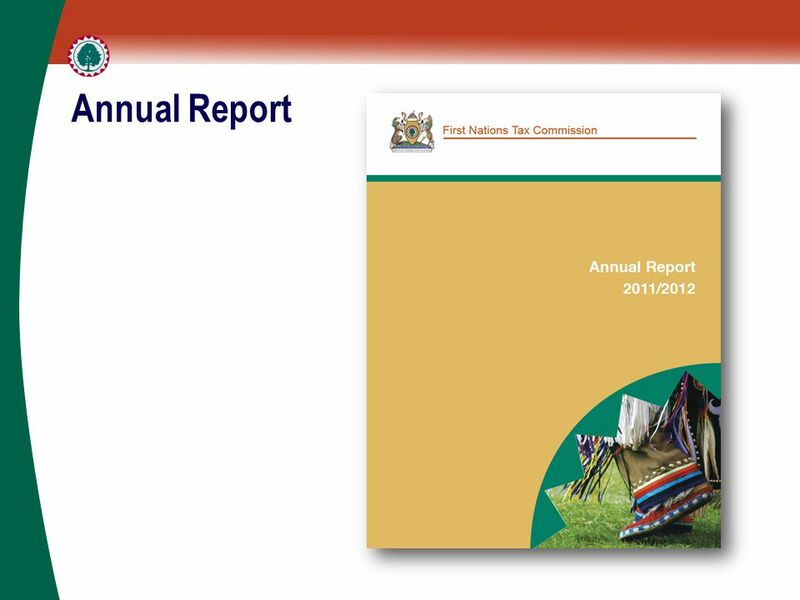 Approximately 8,000 taxpayers from 35 taxing First Nations affected. 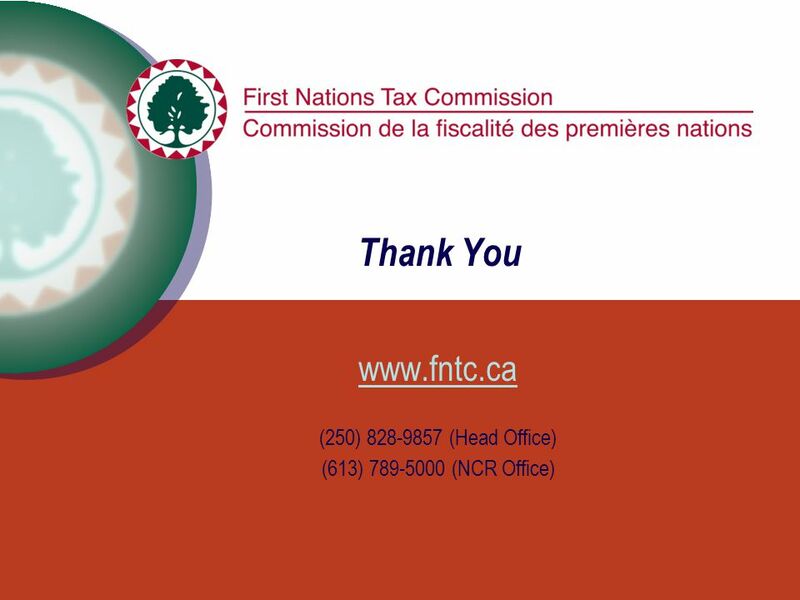 ▶ FNTC and FN tax authorities (e.g., Westbank First Nation) continue to express concerns. ▶ In 2012, BC announced review of carbon tax. Seeking input from British Columbians. FNTC and other stakeholders have made submissions. 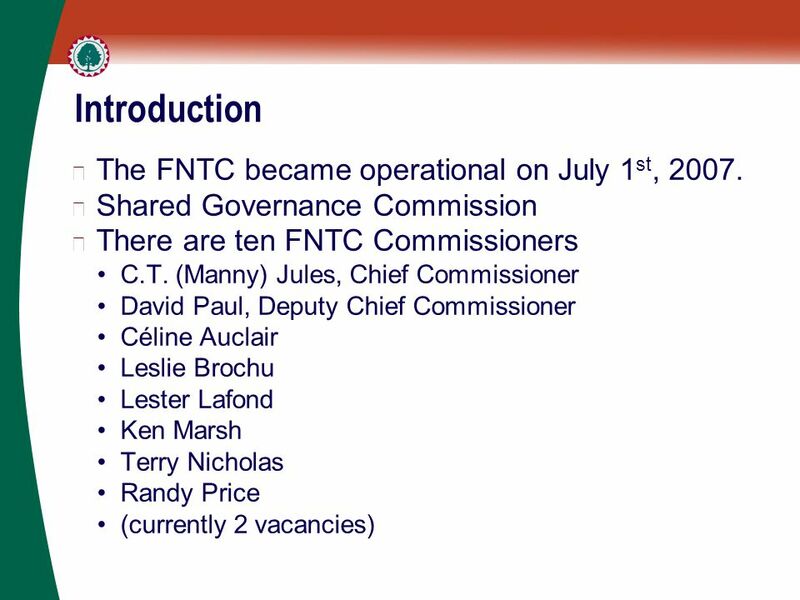 ▶ FNTC provincial revenue sharing with impacted First Nations so that they can provide similar relief to their taxpayers. 29 The Year Ahead Potential FSMA legislative amendments. 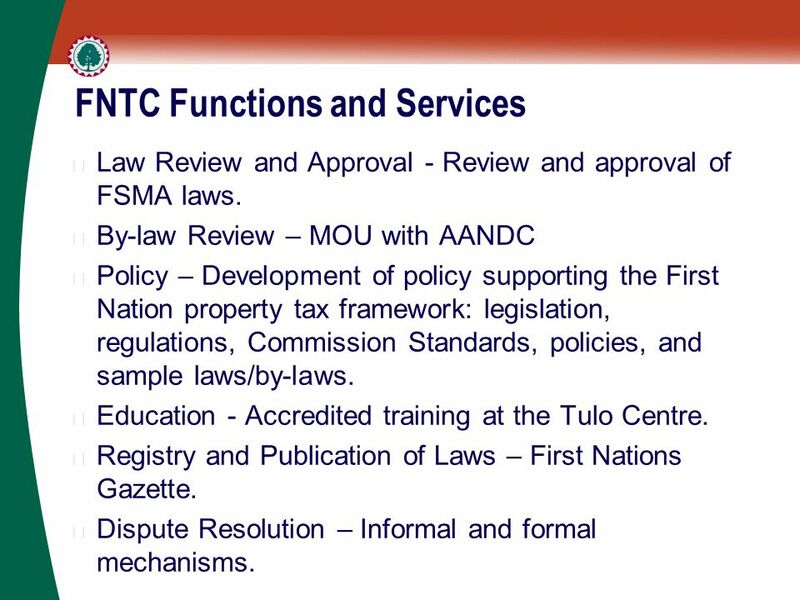 Examining transitional issues for emerging FN tax jurisdictions. BC Carbon Tax and FN Accommodation Tax. Working with assessment service providers. Examining expenditure standards to accommodate interim budgets and contingency reserve funds Research on private placement debentures, service agreements, property tax loss, and well drilling tax. Consulting with FNTAA and FN tax administrators on improving the laws/by-laws policy and procedures. Continue to work with the Institutions and First Nations to support borrowing and revenue options. Download ppt "First Nation Property Taxation Report First Nation Tax Administrators Association 19th Annual National Forum September 26 – 28, 2012 Spirit Ridge, Osoyoos,"
Flight Plan To The Future Ad Hoc Committee P3 Report Overview April 8, 2013.